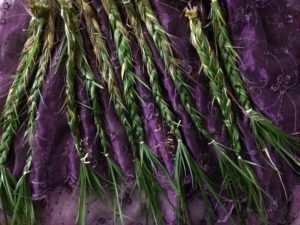 This morning the Sweetgrass called to me…time to harvest. It’s one of my favorite ceremonies. By the time I was finished, I was filled with the sweetness that it brings. And grateful to be the steward of these beautiful plants. Now it rests on the altar, as it is calibrated and infused with the frequencies of gently transformation. Available at Open Studios.